Electric cars have come a long way, but they are still a far cry from expectations of the future. Charging stations are available in more places, and batteries are offering increased mileage. Mechanically, they are equal to if not better than gas-powered counterparts. However, the electric car world is struggling with its futuristic image, which causes some weird choices that are unfortunately tested by trial and error by the consumer. Electric car designers need to focus on their Earth-saving features of alternative energy and leave the future to evolve organically. Here is a short, 2019 Electric Car Review from some of the bestselling electric cars on the market. There is one person that reflects the image of Tesla, and this is Elon Musk. His name has been associated with terms like innovator, barrier-breaker, and crazy man who succumbs to every whim. You can see all of these traits in Tesla’s electric cars. Some of the innovations make sense and break barriers in the electric car industry. However, some of the features simply don’t make sense. 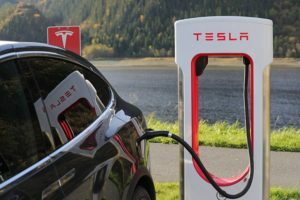 While they do offer a more affordable model, Tesla’s price tag combined with odd features makes this car more of a status symbol than a prudential choice when electric car shopping. This is the “bargain” Tesla, but its projected price was much lower than the actual price turned out to be (surprise surprise). At a price circling $50,000 depending on the battery chosen, this car should be much more comfortable. The back seats are tiny, and the car is overly-reliant on its central touch screen. This car does perform well, and the performance model can get up to 60 mph in 3.5 seconds. This car received a five star safety rating, and it has lots of trunk space. However, its minimalist design and cramped back seat leaves a lot to be desired for this average-level electric vehicle. This is the Tesla everyone thinks of with awe and grandeur. It is Tesla’s luxury speed demon, and its performance shows those seeking sportier vehicles that electric is a more-than-suitable option. It even has a “Ludicrous” mode, which can get to 60 mph in 2.4 seconds. The car can also drive semi-autonomously. The two primary downfalls of this vehicle are the price and the “luxury.” The interior does not have the feel of other luxury vehicles except in the tech arena. The price can exceed $100,000. This is Tesla’s cream of the crop vehicle, and it could use some TLC on the features that don’t seem to matter to the company, like interior design and minor functionality conveniences. Of course, Tesla would make an electric SUV, and it would be ridiculous. It is basically the Model S on steroids. This SUV has an estimated range of 257 miles, and its huge battery pack lowers the center of gravity on the vehicle improving performance. Did we mention it’s all-wheel-drive? But these are the expected features of the top-of-the-line advanced electric SUV. This is not what makes it ridiculous. The ridiculous features are the front windshield that extends all the way over the cab, so you cannot really shield yourself from the sun except with two sun visors. Additionally, the SUV has doors that open upward by pushing buttons that automatically open the door fully. This means you have to catch it, so it won’t hit adjacent cars. It also means there is no room for a ski rack…hardly SUV-like. This SUV is pretty cool, but it misses the mark with unnecessary features that seem gimmicky rather than utilitarian. 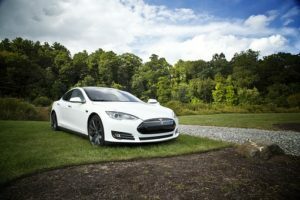 If you want to have a noteworthy vehicle, then Tesla is where it’s at. Just know that you are paying for performance rather than luxury… and state-of-the-art rather than tried-and-true. Depending on what you want, that’s not a bad thing. A much more affordable option than any Tesla is the Nissan Leaf, a modest vehicle offering 150 miles range on the basic option and 226 on the Plus model. This car is pretty basic but has all the modern comforts. It also has some driving assist features. This is a comfortable, economic choice when buying an electric vehicle, but you probably won’t be turning any heads. This vehicle is about as exciting as its price tag suggests, and coming in under $30,000, you won’t be surprised to learn that this vehicle is not really about performance. It is slow, and it is bumpy and rattles at higher speeds with uneven road surfaces. It is not a luxury vehicle, but it does not claim to be. It is perfect for in-town travel, and it has the quiet comfort of a vehicle that has a optimal purpose of small commutes. There are many electric cars out there, and interior features are often a selling point because they all come with touch screens and nuanced features that make them more futuristic that the old gas guzzlers. Don’t let this sway your decision-making process. Pay attention to the charging logistics, hybrid models, and performance. These are the things that are really going to matter when you are out on the road in an electric vehicle. See our post next week about charging your electric car at home. Your outlet and your vehicle change your options.